have their own maintenance facilities. Here are our top nine picks. We organized the list by region (east, west, and central), through most of the companies travel throughout Michigan, the Midwest, and even North America. Now in its 34th year, Bianco Tours & Transportation operates luxury motorcoaches that can accommodate 26, 47, and 56 passengers. The family-owned company specializes in customized and pre-packaged tours to destinations like casinos, sporting events, shopping venues, and live performances. They also plan some quirky and creative day trips. For example, the Rum Runners Tour travels into Windsor (and back in time to the roaring twenties) to explore prohibition and bootlegging from a local vantage point. Happy Birthday Henry celebrates the 150th birthday of Henry Ford with a narrated tour of Dearborn, lunch at the historic Maccabees Building, and a guided tour of the Ford Piquette plant, where the Model T was born. For 40 years, the Cupp family has owned and operated Blue Lakes Charters & Tours, with charter service available to destinations anywhere in the United States or Canada. Along with charter bus service, Blue Lakes also offers a number of pre-packaged tours, scheduled runs to Cedar Point, and casino day trips (Four Winds, Soaring Eagle, Little River, and FireKeepers), complete with rewards and vouchers for slot play, food, and shows. For groups that want to plan their own excursions, the company’s Tour Department can help. Trinity Transportation Group hit the road in 1981—first, as a provider of van service for senior citizens in southeastern Michigan, then, as a provider of bus transportation for special education students in several Wayne County school districts. Today, Trinity’s large fleet of vehicles – more than 100 motor coaches, school buses, vans, and sedans -- includes a 28-passenger “party bus,” equipped with limo-style leather seating, a flat screen TV, five mini bars, rear speakers, and strobe lights. Locally owned and operated since 1983, B&W Charters offers motorcoach transportation for trips originating in western Michigan and northern Indiana. In addition to a fleet of vans and motorcoaches, B&W offers fully enclosed San Francisco-style trolleys with brass rails, oak benches, and an authentic trolley bell. They’re also equipped with panoramic windows for sightseeing . The company’s tour department operates one-day and multiple-day excursion packages, like an upcoming trip to Frankenmuth and Birch Run and a shopping and sightseeing tour to Chicago. With a fleet of luxurious 57-passenger motorcoaches, Holiday Coach specializes in charters for sporting events, winery tours, casinos, and theme parks in Michigan and throughout the Midwest. The luxury buses – built by Volvo and Setra – come with nice amenities like plush reclining seats, TV monitors, reading lights, Wifi, and extra luggage room. Headquartered in Marne, Michigan, just northwest of Grand Rapids, Holiday Coach has been in business since 2003. Cardinal Buses, a family-owned company with charter facilities in Michigan and Indiana, traces its beginnings to Middlebury, Indiana, circa 1923. That’s where Branston Shoup operated the family’s first business, the Middlebury Bus Line, which transported locals from Middlebury to Goshen in a five-passenger Model T touring car. Today, Cardinal Buses maintains a fleet of motorcoaches to accommodate 24, 38, 47, 49, or 56 passengers. With 54- and 58-passenger motorcoaches, Compass Coach is probably best known for its Lucky 777 Coach buses, with day and evening casino trips (from Tuesday through Saturday) to Soaring Eagle, Gun Lake, FireKeepers, and Little River casinos. In addition to vouchers for slot play and food (often exceeding the cost of your bus ticket), Compass Coach also gives away free trips: Get your reward card punched every time you ride and your tenth trip is free. Buses are equipped with the usual luxury amenities, plus mini galley kitchen with microwave and a four-person card table. Dean Trailways was established in 1994 as a sister company to Dean Transportation, a leading North American school bus company specializing in transporting passengers with disabilities. In addition to chartering buses for group trips, Dean Trailways operates packaged tours to sporting events, amusement parks, shopping venues, and casinos. The company also offers Executive Black Car service, featuring a chauffeured Cadillac. Doing business since 1910, Indian Trails—with original coaches named after Michigan Indian chiefs—now operates one of the largest and newest fleets of deluxe motorcoaches in Michigan. Indian Trails, with three facilities in the Lower Peninsula, serves West Michigan, Central Michigan, and Southeast Michigan. 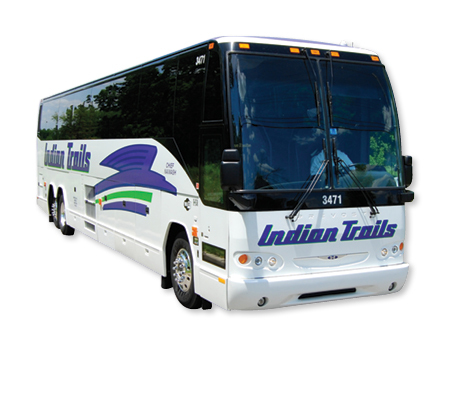 With buses to accommodate from 29 to 56 passengers, Indian Trails offers charters, tours, shuttles, airport transfers, casino runs, and daily scheduled routes throughout Michigan and to Chicago and Milwaukee. In 2012, Indian Trails logged 4.6 million miles, carrying more than 1,000,000 passengers. Professional event planners helped us compile a guide for people that are booking a charter for thier group. It is a quick read and a wonderful reference for creating the right travel expereince for your group. Cick on the image above and your FREE guide will be emailed to your inbox immediately.